Liquid Handling Systems Market size was valued over USD 1.4 billion in 2017 and is expected to witness more than 5% CAGR from 2018 to 2024. Growing R&D and clinical trials by pharmaceutical companies as well as biotechnology industry will foster the liquid handling system market growth over the projection years. Clinical trials and drug discovery have increased incredibly over the past few years due to growing number of serious diseases. Also, increased drug development will bring new compound with proven therapeutic effect to the market; requiring extensive use of liquid handling systems, thereby boosting the market growth. Increasing application of various laboratory processes such as serial dilution, PCR, array printing, plate replication, cell culture and whole genome amplification is also driving the liquid handling systems industry growth. Growing awareness about early disease diagnosis and prevention has stimulated demand for these laboratory processes for detection of cancer and infectious diseases at an early stage. Therefore, introduction of manual as well as automated liquid systems in laboratories is augmenting to industry expansion. The liquid handling devices market is anticipated to grow moderately as such equipment delivers precise control for sample and reagent volume transfers, ensuring reproducible results, while making work in the laboratory much easier. Furthermore, automated systems are resulting in reliable and consistent processes and let goes off from any tedious pipetting, hence allowing individuals to focus on other significant laboratory tasks. 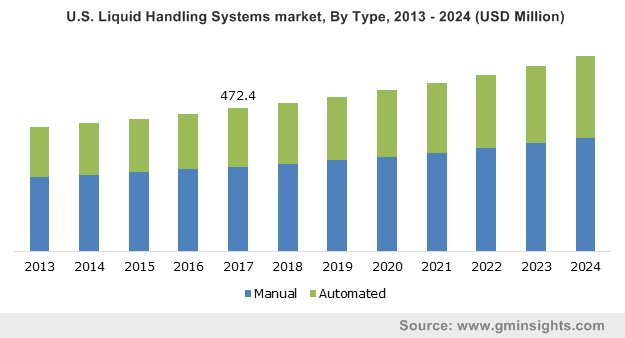 Manual liquid handling systems market segment held significant share of total product market valuation, accounting for a total value of USD 844.9 million 2017. The large volume of such products along with lesser costs is the major factor contributing towards the large market share of these devices. Some of the players operating in this segment are Tecan, Eppendorf, Thermo Fisher Scientific, Inc., BioTek Instruments, Inc. and Gilson Incorporated. Automated liquid handling systems market segment is estimated to expand at a CAGR of 5.9% over the forecast period. Automated systems reduce the time spent on repetitive pipetting tasks at any throughput level; hence, meeting multiple liquid handling requirements. In addition, automated tools are designed in such a manner that sampling, mixing, and combining of liquid samples are done automatically without any severe efforts. Liquid handling consumables market segment dominated the industry, accounting for USD 564.1 million in 2017. Greater application, lesser price and repetitive purchase is responsible for the growth of consumables market segment. In addition, consumables are used vastly for some of the major application such as sample preparation in mass spectrometry and PCR, hence accelerating the market growth. Automated workstation market segment is estimated to expand at a CAGR of 6.0% during the forecast timeframe. Factors such as greater flexibility, improved performance, and enhanced productivity will boost the market growth. Furthermore, automated workstations are modular that be further customized to suit various applications, such as proteomics, cellular analysis sample preparation for genomics, etc., thereby propelling the demand for automated workstation. Pharmaceutical & biotechnology industry market generated maximum revenue share in the year 2017 with a value of USD 635.5 million. Researchers in huge pharmaceutical companies are constantly overcoming bottlenecks in drug discovery and development by using automated liquid systems. Such devices aid in drug discovery by streamlining the whole workflow of sample preparation, hence driving the market growth in pharmaceutical & biotechnology industry. Liquid handling systems usage in diagnostic centres is expected to experience robust growth at 5.8% over the projection period. Increasing incidence of lifestyle diseases such as atherosclerosis, heart disease, stroke, obesity and type 2 diabetes and growing investment in R&D to develop cost effective therapeutic options will drive the growth of diagnostic centers in liquid handling system market. U.S. market valued USD 472.4 million in the year 2017. Presence of large number of pharmaceutical companies as well one of the most developed biotechnology sectors in the U.S. is boosting the market. In addition, scientific and technological advancements as well as growing understanding of the underlying mechanisms of disease are increasing the development of new therapeutic treatments for U.S. patients. India market is estimated to expand at a CAGR of 7.7% during the forecast timeframe. Factors such as growing biotechnology studies, and increased prevalence of infectious disease that requires strong diagnosis will drive the demand for liquid handling devices in India. Growing R&D funding by the Indian government for healthcare spending will also positively impact liquid handling systems in India. The Indian government has always initiated significant reforms designed to improve the nation’s standing in the healthcare sector, hence attributing to market growth. Some of the leading key players include Gilson Incorporated, Tecan, Hamilton Co., Eppendorf AG, Thermo Fisher Scientific, Inc., Sartorius and others. These medical devices companies have implemented strategic decisions such as mergers, acquisitions and partnerships to expand their product portfolio and geographic reach. In addition, new product launches and increasing R&D activities pertaining to automated liquid handling systems has increased the market player’s effective capabilities, thereby resulting into better sustainability in the market. 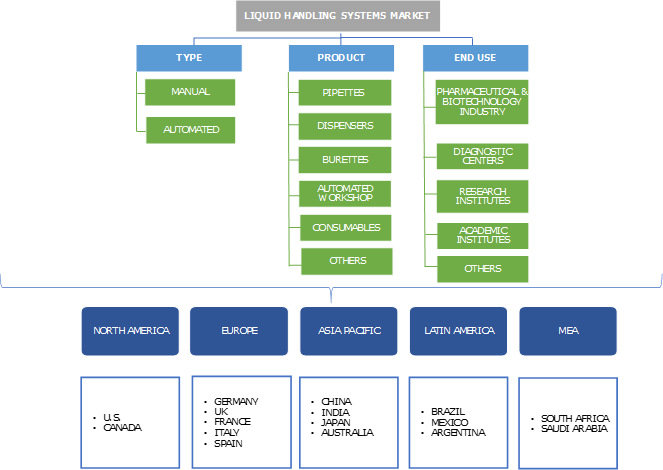 Liquid handling systems market has various companies capturing major share in the global market. The market is expected to grow moderately due to increasing number of pharmaceutical companies, growing demand of vaccines and high-throughput screening. The biotechnology industry of developing countries is forming a wide research network through strategic alliances with liquid handling devices companies to access diverse technology platforms for their streamlined workflow, hence accentuating the market growth over the projected years.